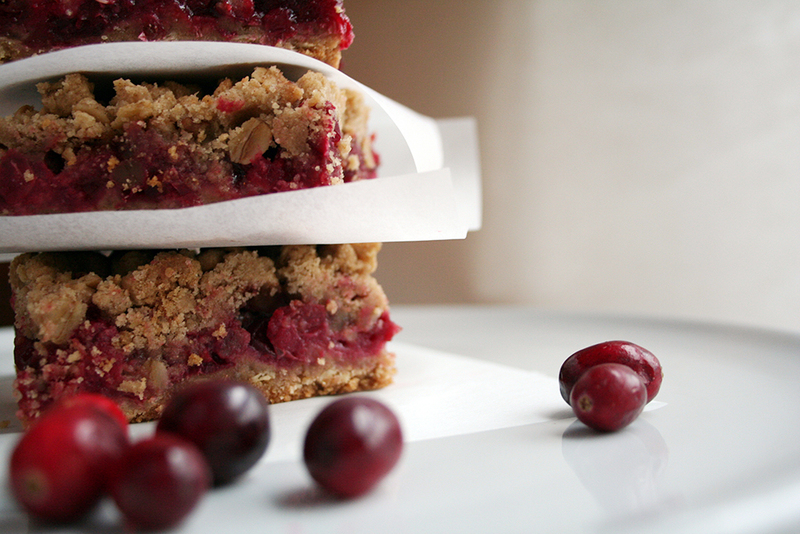 These Cranberry-Lime Pecan Crumb Bars are a more sophisticated twist on the humble crumb bar. With a hint of lime in the filling and olive oil in the crust, you can’t go wrong. You will want to put bags of fresh cranberries in the freezer just to make these all year round, they are that good! You can substitute your favorite flour combination to make these gluten-free, or brown the butter for a more nutty flavor! Overall, this recipe is extremely adaptable; it can be used with any berries that are in season – just change out the citrus to a complementing flavor (i.e., blueberry-lemon, raspberry-lime, strawberry-rhubarb with lemon or orange!). Or, add some citrus zest to the filling for more heightened flavors. 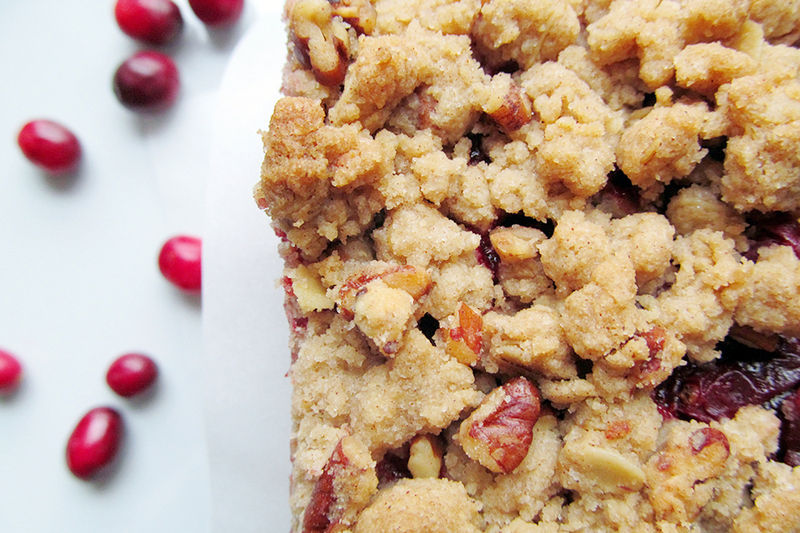 Also, see our Apple Pie Crumb Bars for another holiday flavor combination. Refrigerating the bars before cutting helps with getting perfect squares. However, if you aren’t looking to cut a picture perfect square, you can just cool them to room temperature and eat while still slightly warm. 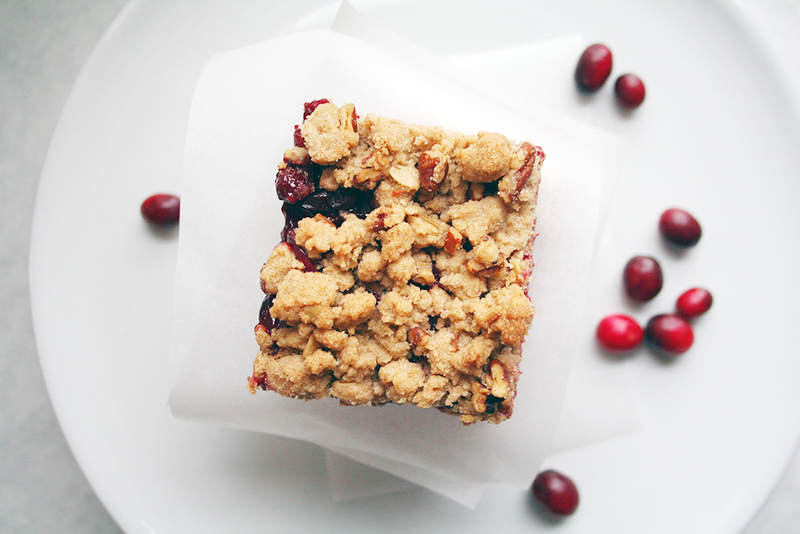 However you pursue your future crumb bar endeavors, you must try this Cranberry-Lime combination. These bars add a great pop of color and flavor to any holiday dessert table… plus, they are so easy! In a heavy saucepan over medium heat melt the butter. With a fork, in a large bowl, mix the crust/topping ingredients together except for the chopped pecans. Reserve 1 cup of the mixture, for the topping, and set aside. Press the remainder into a 8x8 inch glass baking dish. With a wooden spoon or spatula, stir together the filling ingredients and pour into the baking dish over the crust. Mix the cup of reserved crumb topping with the chopped pecans, sprinkle the crumb over the filling. Bake for 50-60 minutes or until top is golden brown. Cool and serve. Instead of an 8x8 inch baking dish try a 9 inch pie pan and serve just like you would your favorite pie.